The combination of poetry, music and art is not really a new concept. However, the way it will be tied together for The Colour of Sound, is completely new in Abu Dhabi. I have the honour to take a live painting part in the upcoming inaugural The Colour of Sound event together with artist B’lu. Besides us both fine artists, the entire performance team will consist of four of the best international poets in town and a band assembling a choice of Abu Dhabi’s finest musicians. And now imagine following: While the poets perform, musicians will play on the spot inspired improvised sounds to the poetry and we artists will paint inspired of the texts and to the music. While poets and musicians will rotate in pairs, each of us artists will work on big canvas, to weave elements of all other contributions together to an artwork mirroring the the entire evening of diverse creativity. To spice it up even more, we will work only with the basic colour set: red, blue, yellow, green, black and white. The excitement for me as fine artist is the challenge to combine all these different inspirations of poetry and music during that evening. Not knowing what comes next, always the risk to get triggered or to not being able to relate at all. The task to take something out of each performance and bring it on canvas in a way leading to an entire whole piece of art. It will be a true speed painting, given that at the end of the evening the artwork will be declared as finished and can not be altered anymore. These artworks of B’lu and me will be offered for sale afterwards, so you can be sure we will not “just throwing some paints on canvas”. It will be a demonstration what we artists can do just with our skill set and experience, directly inspired on the spot without any previous preparation, only using a minimum on basic colours. A true challenge, but a very exciting one to take! 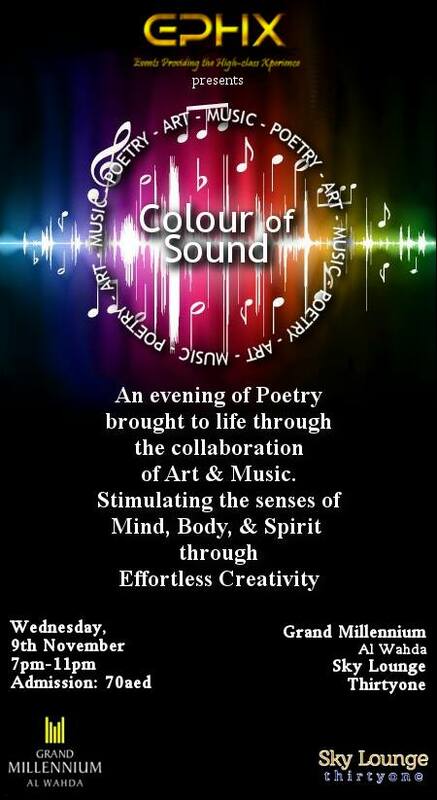 The Colour of Sound is presented by EPHX and will take place for the first time on Wednesday 9th November 7pm at Sky Lounge Thirtyone, Gand Millenium Hotel, Al Wahda in Abu Dhabi. It will continue on monthly base with always a new exciting team of performers. This entry was posted in Art Blog English. Bookmark the permalink.